Have just returned from yet another wonderous trip to India. While there I had a frantic text message "could you please find an amazing tent for a 50th birthday celebration.... in 10 days". I immediately phoned my great trader friends in Jaipur for an instant vintage wedding tent. They were up for the challenge and called their tailor who cycled in from his village to commence work on the 12 metre x 6 metre tent. 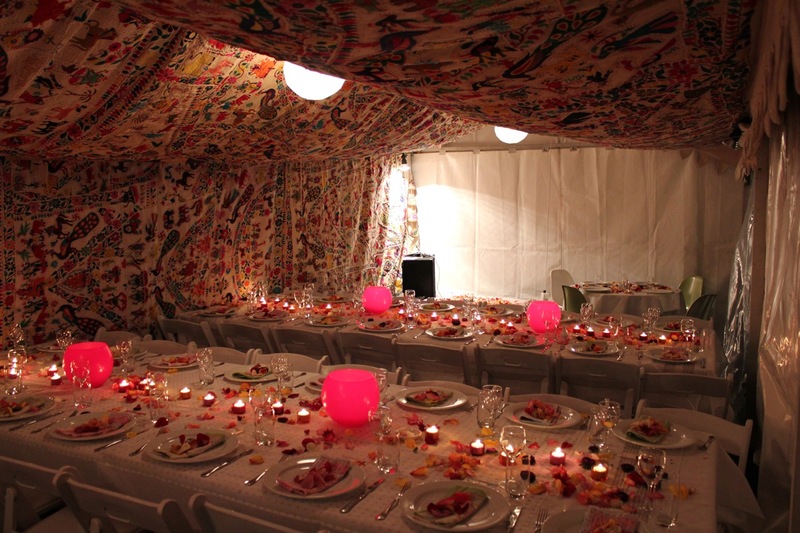 He worked night and day, sewing together endless exquisite vintage applique panels and completed the tent in 5 days. 71 kilos all rolled into a giant bundle of bubble wrap and couriered express beyond express. A vintage sari and turban followed, of course, to complete the maharajah and maharani celebrations. I must say it was all rather nervewracking and I was totally thrilled it was so appreciated. Couldn't have been done without mobile phone, photos, e-mails and texting....all done in 98% humidity and 35 degree heat, not to mention monsoon floods as the car floated across the street. Wow Sally that looks amazing! How clever you are dealing with the Indian delivery system and getting it there in time. So nice curtians and design you have used in your Raj Tent preparation and as you trust your service provider i really impressed by this.